Thoroughly wash toor dal and soak in water for 15 minutes; cook it in a pressure cooker with enough water, turmeric powder and curry leaves. Heat oil in a non-stick pan; stir-fry chopped shallots, green chillies and potato for few minutes. Then add chopped tomato and potatoes; stir for a while. Cook Covered on low flame till the tomatoes turn mushy. Extract tamarind juice by soaking it in warm water for 15 to 20 minutes. In between roast grated coconut with curry leaves till it becomes brown. Then add red chilli powder, coriander powder and grind this to fine paste. This is the masala for the sambar. 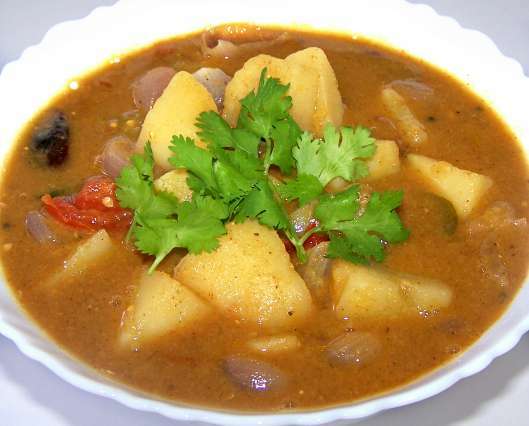 When potato is half cooked mix it with dal , add some water and boil it until the potato is well cooked. At this stage add tamarind juice, salt, asafoetida powder and fenugreek seeds powder. Reduce the flame. Finally add the prepared sambar masala and stir well. Again boil it in low flame till the gravy thickens. Heat oil in a pan, add mustard seed and allow it to crack, add shallots, dry red chillies, cumin seeds and curry leaves. Fry for half a minute. Add this seasonings to the sambar, give a quick stir.